Syntarsus kayentakatae belongs to a lineage of theropods called Ceratosauria. Analyses by the author and others support the hypothesis that Ceratosauria is a natural monophyletic group, although a few recent studies argue that Ceratosauria is not monophyletic. Current evidence suggests that ceratosaurs existed from the late Triassic Period until the disappearance of non-avian dinosaurs at the end of the Cretaceous Period. Ceratosauria does not include the theropod lineage that leads to birds. Ceratosauria is divided into two major groups. Ceratosauroidea includes large, robust forms such as Ceratosaurus nasicornis and abelisaurids such as Carnotaurus sastrei. Coelophysoidea includes small to medium sized, lightly built species such as Coelophysis bauri, Dilophosaurus wetherilli, and two species of Syntarsus, Syntarsus rhodesiensis from Africa and Syntarsus kayentakatae. Syntarsus kayentakatae is known only from Early Jurassic aged rocks (roughly 200 million years old) of northern Arizona. It was a relatively small theropod, around two and a half to three meters long. 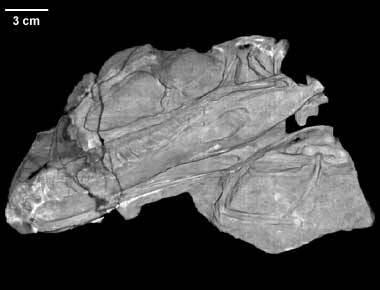 The scanned skull belongs to the holotype skeleton of Syntarsus kayentakatae (MNA V2623). The skull measures 23 cm from the tip of the snout to the rear of the occipital condyle. A photograph of the holotype specimen Syntarsus kayentakatae - left-lateral view. This specimen was found at the base of this low ridge, near the middle of the picture. The skull of coelophysoid ceratosaurs was loosely constructed in life. In death, the holotype individual probably came to rest on its left side and was partially buried, stabilizing the bones of the left side of the skull. The right side of the skull may have remained exposed to water currents as it began to decompose. The loosely connected bones detached and drifted out of place before the entire skull was finally buried. Later, the great weight of overlying sediment distorted the skull. The bones of the snout and palate were crushed flat against one another. The braincase and rear of the skull were rotated clockwise (to the right) and pushed downward. The bones of the right side of the snout, and the braincase broke apart from one another just forward of the orbits. It was not possible to align the scanner so as to section all the cranial bones were in the same plane when the skull was scanned, because of all this distortion. The specimen was scanned using the flattened sides of the snout to orient the specimen. Therefore, the XY (horizontal) and XZ (sagittal) scan images of the skull are symmetrical through the bones of the palate and snout, but the braincase was scanned roughly 33 degrees off from its XYZ axes. This specimen was scanned in March 1998, in the University of Texas High Resolution X-ray CT Facility, by Dr. Richard Ketcham and Dr. Cambria Denison. Settings were 410kV (kilovolts), and 4.8mA (milliamperes). No filter was used. The specimen was packed in a garnet silt wedge to reduce artifacts produced by beam hardening, although as discussed below this was not entirely successful. The specimen was scanned in the YZ (coronal) plane at 1mm thick slices, with an interslice spacing of 0.8mm. The field of reconstruction was 160mm. The raw data were exported as 16-bit and 8-bit data sets. The 8-bit dataset was processed to remove the image of the garnet silt wedge, creating an 8-bit modified (8bitmod) dataset. This work was done in Adobe Photoshop by Cambria Denison, Adrienne Barnett, and Romy Schneider. Digital processing of the 8bitmod dataset was begun in January 1999 by the author. Individual image contrast and resolution levels were adjusted by batch processing in Adobe Photoshop 4.0.1. Reslicing of the dataset to yield XY (horizontal through the snout) and XZ (sagittal through the snout) planes was accomplished using NIH Image 1.62b17_ppc. File Buddy 5.0.1 was used to rename large sets of individual slice images to facilitate ease of labeling and file transfer. Animated movies were created with Apple MoviePlayerPro. Although the specimen was packed in garnet silt, with the intent of reducing scanning artifacts that could potentially be misinterpreted as real morphological data, the data set possesses a significant artifact in the form of "rings". A ring artifact can be caused by detector drift and detector energy dependence. Obvious rings are present in the YZ (snout coronal) images and animation. When the YZ images were resliced to create the XY (snout horizontal) and XZ (snout sagittal) images, the rings were also sliced, resulting in bright longitudinal lines traversing the images. These lines tend to "travel" up and down through the animations. Be aware of them when viewing the images, for they do not represent true morphology. Few have closely examined coelophysoid ceratosaurs over the years, with notable exceptions. The references below do not all deal with Syntarsus, nor with ceratosaurs for that matter, but they are useful works with bearings on the phylogeny or cranial osteology of various Theropoda and Saurischia. Bonaparte, J. F., F. E. Novas, and R. A. Coria. 1990. Carnotaurus sastrei Bonaparte, the horned, lightly built carnosaur from the middle Cretaceous of Patagonia. Natural History Museum of Los Angeles County Contributions in Science 416. Britt, B. B. 1991. Theropods of Dry Mesa Quarry (Morrison Formation, Late Jurassic), Colorado, with emphasis on the osteology of Torvosaurus tanneri. Brigham Young University Geology Studies 37:1-72. Britt, B. B., C. A. Miles, K. C. Cloward, and J. H. Madsen. 1999. A juvenile Ceratosaurus (Theropoda, Dinosauria) from Bone Cabin Quarry West (Upper Jurassic, Morrison Formation), Wyoming. Journal of Vertebrate Paleontology 19(Supplemental to no.3):33A. Chure, D. J., and J. H. Madsen. 1996. Variation in aspects of the tympanic pneumatic system in a population of Allosaurus fragilis from the Morrison Formation (Upper Jurassic). Journal of Vertebrate Paleontology 16:63-66. Chure, D. J., and J. H. Madsen. 1998. An unusual braincase (?Stokesosaurus clevelandi) from the Cleveland-Lloyd Dinosaur Quarry, Utah (Morrison Formation; Late Jurassic). Journal of Vertebrate Paleontology 18:115-125. Currie, P. J. 1995. New information on the anatomy and relationships of Dromaeosaurus albertensis (Dinosauria: Theropoda). Journal of Vertebrate Paleontology 15:576-591. Currie, P. J., and X. J. Zhao. 1993a. A new large theropod (Dinosauria: Theropoda) from the Jurassic of Xinjiang, People's Republic of China. Canadian Journal of Earth Sciences 30:2037-2081. Currie, P. J., and X. J. Zhao. 1993b. A new troodontid (Dinosauria: Theropoda) braincase from the Dinosaur Park Formation (Campanian) of Alberta. Canadian Journal of Earth Sciences 30:2231-2247. Colbert, E. H. 1989. The Triassic Dinosaur Coelophysis. Bulletin of the Museum of Northern Arizona 57. 160 pp. Forster, C. A. 1999. Gondwanan dinosaur evolution and biogeographic analysis. Journal of African Earth Sciences 28(1):169-185. Galton, P. 1985. Cranial anatomy of the prosauropod dinosaur Plateosaurus from the Knollenmergel (Middle Keuper, Upper Triassic) of Germany. II. All the cranial material and details of soft-part anatomy. Geologie und Palaeontologie 19:119- 159. Gauthier, J. A. 1986. Saurischian monophyly and the origin of birds. Memoirs of the California Academy of Science 8:1-55. Gilmore, C. W. 1920. Osteology of the carnivorous Dinosauria in the United States National Museum, with special reference to the genera Allosaurus (Antrodemus) and Ceratosaurus. United States National Museum Bulletin 110:1-159. Holtz, T. R. Jr. 1994. The phylogenetic position of the Tyrannosauridae: Implications for theropod systematics. Journal of Paleontology 68:1100-1117. Madsen, J. H. 1976. Allosaurus fragilis: A revised osteology. Bulletin of the Utah Geological and Minerological Survey 109:1-163. Madsen, J. H., and S. P. Welles. 2000. Ceratosaurus (Dinosauria, Theropoda). A revised osteology. Utah Geological Survey Miscellaneous Publication 00-2. Padian, K., J. R. Hutchinson, and T. R. Holts, Jr. 1999. Phylogenetic definitions and nomenclature of the major taxonomic categories of the carnivorous Dinosauria (Theropoda). Journal of Vertebrate Paleontology 19:69-80. Raath, M. A. 1977. The anatomy of the Triassic theropod Syntarsus rhodesiensis (Saurischia: Podokesauridae) and a consideration of its biology. unpublished Ph.D. Dissertation, Rhodes University, Salisbury. 233 pp. Raath, M. A. 1985. The theropod Syntarsus and its bearings on the origin of birds. pp 219- 227 in M. K Hecht, J. H. Ostrom, G. Viohl, and P. Wellnhofer (eds.) The Beginnings of Birds: Proceedings of the International Archaeopteryx Conference, Eichstatt. Raath, M. A. 1990. Morphological variation in small theropods and its meaning in systematics: evidence from Syntarsus rhodesiensis. Pp. 91-105 in K. Carpenter and P. J. Currie (eds.) Dinosaur Systematics: Approaches and Perspectives. Cambridge University Press, San Diego. Romer, A. S. 1956. Osteology of the Reptiles. University of Chicago Press, Chicago, 772 pp. Rowe, T. 1989. A new species of the theropod Syntarsus from the Early Jurassic Kayenta Formation of Arizona. Journal of Vertebrate Paleontology 9: 125-136. Rowe, T., and J. Gauthier, 1990. Ceratosauria. pp 151-168 in D. B. Weishampel, P. Dodsen, and H. Osmolska (eds. ), The Dinosauria. University of California Press, Berkeley. Rowe, T., R. S. Tykoski, and J. Hutchinson. 1997. Ceratosauria. pp. 106-110 in P. J. Currie, and K. Padian (eds), Encyclopedia of Dinosaurs. Academic Press. San Diego. Sereno, P. C. 1997. The origin and evolution of dinosaurs. Annual Review of Earth and Planetary Sciences 25:435-489. Sereno, P. C. 1998. A rationale for phylogenetic definitions, with application to the higher-level taxonomy of Dinosauria. Neues Jahrbuch fur Geologie und Paläontologie Adhandlungen 210(1):41-83. Sereno, P. C. 1999. The evolution of dinosaurs. Science 284:2137-2147. Sereno, P. C., and F. E. Novas. 1993. The skull and neck of the basal theropod Herrerasaurus ischigualastensis. Journal of Vertebrate Paleontology 13:451-476. Stovall, J. W., and W. Langston, Jr. 1950. Acrocanthosaurus atokensis, a new genus and species of Lower Cretaceous Theropoda from Oklahoma. American Midland Naturalist 43:696-728. Tykoski, R. S. 1998. The Osteology of Syntarsus kayentakatae and its Implications for Ceratosaurid Phylogeny. Unpublished Masters Thesis, The University of Texas at Austin. 217 pp. Welles, S. P. 1984. Dilophosaurus wetherilli (Dinosauria, Theropoda) osteology and comparisons. Palaeontographica Abt. A. 185:85-180. Whetstone, K. N. 1983. Braincase of Mesozoic birds: I. New preparation of the "London" Archaeopteryx. Journal of Vertebrate Paleontology 2:439-452. Witmer, L. M. 1997. The evolution of the antorbital cavity of archosaurs: A study in soft-tissue reconstruction in the fossil record with an analysis of the function of pneumaticity. Society of Vertebrate Paleontology Memoir 3: 1-73 [supplement to Journal of Vertebrate Paleontology 17(1)]. Zhao, X., and Currie, P. J. 1993. A large crested theropod from the Jurassic of Xinjiang, People's Republic of China. Canadian Journal of Earth Sciences 30:2027-2036. There are surprisingly few websites that offer relatively accurate information about ceratosaurid theropods. To view images of some, or learn about their relationships to one another and other dinosaurs, try the following sites. To cite this page: Dr. Ron Tykoski, 2001, "Syntarsus kayentakatae" (On-line), Digital Morphology. Accessed April 25, 2019 at http://digimorph.org/specimens/Syntarsus_kayentakatae/.